Travis Hendricks obituary. Carnes Funeral Home. Travis Hendricks was born January 5, 1915 to the loving parents of Cleveland Hendricks Sr. and Rosie Barrins of Brazoria, TX. As an adult Travis moved to Galveston, TX seeking employment, which he found with the Galveston Wharves as a longshoreman. He achieved the status of foreman and retired in 1975 after many years of service. 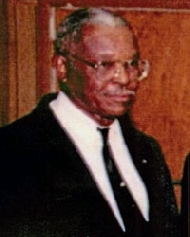 Travis was preceded in death by his first wife, Velma Horace Hendricks in 1994 and his second wife, Hazel Woodson Hendricks in 2006. He leaves to cherish his memories, brother Cleveland Hendricks Jr. (Shirley), nephew Perry Johnson, devoted niece Sadie Smith (Reverend R. L. Smith), a devoted daughter, Sharon Cheatum Kiel, daughters Lynthia Cheatum, and Wynthia Cheatum Brewster, son Frank S. Cheatum , a devoted grandson Aaron Kiel (T’Liza), devoted granddaughter Te Mia Kiel Daniels (Patrick) and a host of other relatives and friends and church family. Travis has been a devoted, loyal member of the Amity Masonic Lodge for many years. A Celebration of Life will be held Monday, April 22, 2013 at 12 Noon at Shiloh A.M.E. Church, 1310 Martin Luther King Boulevard, Galveston, Texas with Reverend Kevin Hodge Sr. officiating.